"Let us say a prayer that this piece of land, small as it may be, can be more than a symbol." Today's trailer is for an indie sci-fi/post apocalyptic film that premiered at Sundance to rather dismal buzz. It's the second feature from Jake Paltrow, younger brother of Gwyneth Paltrow, whose debut was The Good Night from 2007. This one, titled the Young Ones, is another genre-mixer set in the future, but with the tone and style of a Dust Bowl western. Kodi Smit-McPhee stars as the nomad son of Michael Shannon, and Nicholas Hoult actually plays a villain, with Elle Fanning his girlfriend. These first trailers are early promos that may not stay online, but as a first glimpse I'm intrigued to see how this looks. If you're curious, take a look. Young Ones, both written and directed by Jake Paltrow, first premiered at Sundance 2014 earlier this year. 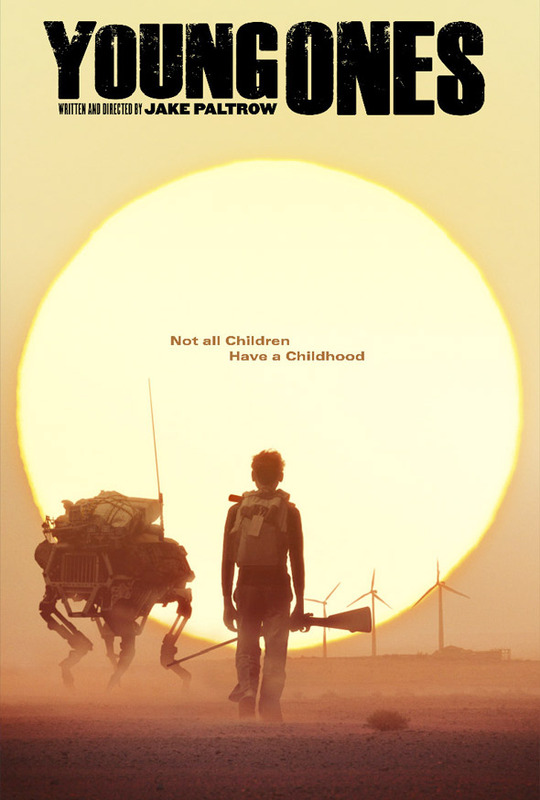 Screen Media Films will release Young Ones in select theaters this fall - but no release is set yet. Stay tuned. Damn! This looks good. Has a kind THERE WILL BE BLOOD feel to it. Added to my must-see list. Plus, it's using those creepy "dog" robots. The dog robots are no sci-fi. They are the real thing made by Boston Dynamics. Didn't Google buy that company? 2014 is the year of the eco-disaster film. Um... wow. Looks friggin' awesome. I do enjoy the dystopian post apocalyptic flicks. Looks good, once the oil runs out this is what we'll be doing.